LOOKING FOR SOMETHING MORE INTERESTING THAN TRADITIONAL GRAY CONCRETE? 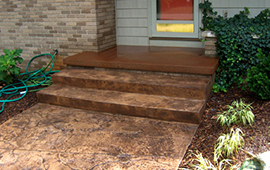 We can add pizzazz to your project with colored and stamped concrete. From a wood plank dance floor to a London Fan driveway to a flagstone patio, we have done it all. Maybe you just want to add a brick border to your driveway. Or create a more natural look with an exposed aggregate sidewalk in your back yard garden. With decorative concrete, the possibilities are endless. 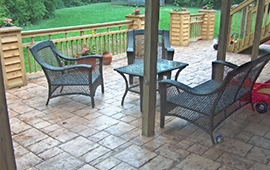 Schedule free home consultation with our certified decorative concrete specialist today. The look of colorful pavers, brick or flagstone, without the hassle of growing weeds and ant hills. Let our certified decorative concrete technicians build you that perfect patio, sidewalk or driveway that will bring a unique distinction to your home. Is your front porch solid but boring? Bring some interest to your front door by considering one of the many colors and textures we can create using a concrete overlayment system. Similar to stamped concrete, the stamp design is placed in a colored base that is applied to your existing concrete slab. 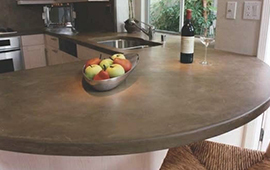 Residential, commercial, indoor & outdoor, concrete countertops have quickly become the latest trend in home design. Not only are they stain, heat & scratch resistant but also allow for awesome shapes, lines, colors and finishes. 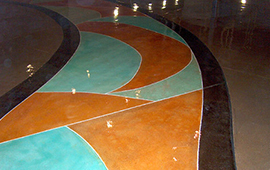 Whether it be an intricate and detailed design or a subtle wash of color, acid stained concrete can bring color and interest to your concrete floor.